The Australian multi-national corporation Lendlease, has threatened Haringey Council in north London with legal action if it cancels the contract for gentrification of its housing stock. The Haringey Development Vehicle (HDV), was agreed by the council under the leadership of Claire Kober, who has now resigned as a councillor to take up a post as the new director of housing at Pinnacle Group, another housing developer. 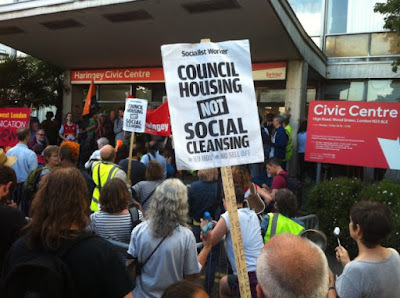 Many of the Labour councillors who supported Kober and HDV have now stood down, and their replacements were all anti-HDV, along with most of the council’s social housing tenants. Indeed it was this very issue that forced Kober and her supporters out, just prior to this year’s local government elections in May. HDV is a form of social cleansing, where social housing (where rents are around 30% of the market rate) is replaced with homes for sale or at full market rate rent. Lendlease have agreed to provide 1000 homes for ‘affordable rent’ (around 80% of the market rate), which amounts only about 10% of the homes in the new development. We have previously reported about the HDV fiasco on this blog, here, here and here. HDV was challenged in the High Court, where Lendlease won, but is currently awaiting an appeal judgement. The Chief Executive Officer of Lendlease, Dan Labbard, has written two letters this month to the new leader of the council, and the Chief Executive, one on 4 July (see here) and the latest on 9 July (see here). In the 9 July letter he says that ‘we will have no choice but to seek to protect Lendlease’s interests given very significant investment over the last two and half years.’ This includes no doubt the cost of defending the High Court Judicial Review and the appeal, but this is all part of the democratic processes in the UK, which the company appears to hold in complete contempt. So there you have it. Lendlease is threatening Haringey Council with a lawsuit to recover costs and compensation if HDV is cancelled, and their reasoning is that the council would be acting irrationally if they did. There is no doubt that Haringey does have an urgent need for new housing, as does much of London, but HDV is not what is needed by any rational measure. HDV would demolish thousands of social housing units and replace them with high cost accommodation, either for sale or rent. Most of the existing tenants would not be able to afford even the 10% of homes that would be available for ‘affordable’ rent, let alone the other 90%. HDV is nothing to do with addressing the borough’s urgent housing needs, but all about Lendlease making a big fat profit by throwing less wealthy people out of their homes and moving wealthier people into the new developments. It is crystal clear that the previous Labour leadership of the council were kicked out of office (replaced by anti-HDV councilors), because the scheme is so unpopular locally, so why should this development proceed? Where is the rationally in that? Similar developments are planned or happening in other parts of London, where they are unpopular too, precisely because they do not address the housing crisis in London in any kind of satisfactory way. The will of the people, to borrow a phrase from the head banging Brexiters, is being held in contempt here, so I do hope the new council tells Lendlease where to go. There is a lobby of the council Cabinet meeting on Tuesday 17 July at 5.30pm at Haringey Civic Centre. Those who wish to observe the meeting will be able to do so from the council chamber balcony, but people should do so respectfully. Meanwhile central government funding for local authorities closing in about a year or two, and the fact that Child Poverty Action Group e-mailed me this past week saying: "Half of all children in the UK live in families who will receive universal credit when the rollout is complete..."
Central government and Kober Haringey policy has been to besmirch the reputation of benefit claimants and social housing tenants so much that outside the polling wards affected by HDV, public opposition has been minimised. The scenario of central government abandoning funding of local authorities and the fallout from 'Universal Credit full roll-out' in themselves represent a 'perfect storm' of the sort highlighted in an 2015 poster campaign 'The Perfect Storm'. The Charity Commissioners told Oxfam that they were being 'too political'. In the event of UC full roll-out and unaffordable Council Tax demands on those too poor to pay Council Tax, no doubt Lendlease are banking on Haringey's housing stock tenants getting evicted so as to crate 'vacant possession'. How was that Charity Commission clampdown on Oxfam's 'heads up' for censorship so that UK society could 'sleepwalk' into the clutches of monsters like Lendlease? UPDATE - Tonight Cabinet decided not to proceed with the HDV. Other decisions included establishing a Fairness Commission and establishing a wholly owned company to provide more affordable homes.